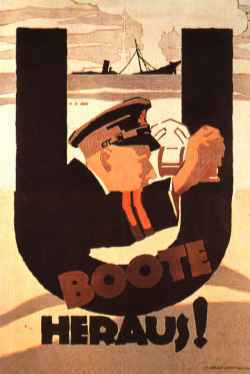 German recruiting poster: The U-boats are out there! Specializing in rare and out-of-print books, posters and ephemera on all aspects of military, naval and aviation history. Member of Antiquarian Booksellers Association of America. We appraise collections for both insurance and donation purposes inaccordance with IRS guidlines. Also available are details of battlefield tours to France and Flanders. Selling new, used, and rare WWI books since 1987. "Then and Now" 1914-1918: Images for sale in frames, also small, personal battlefield tours to France and Belgium, including places rarely visited, and "Return to Armageddon" Battlefield tour guide, video. Specializing in T.E. Lawrence. Editor of T.E. NOTES: A T.E. Lawrence Newsletter. Free book searches performed on all WWI topics. New, used & scarce books covering all aspects of the Great War. Topics include: AEF, Africa, American Volunteers, Art, Atrocities, Australians, Aviation, Bruce Bairnsfather, Balkans, Albert Ball, Oswald Boelcke, Bolsheviks, Vera Brittain, BEF, Campaigns, Canadians, Diplomacy, Eastern Front, Equipment, Foch, French Army, Gallipoli, General Histories, German Army, Gold Star Mothers, Ivor Gurney, Georges Guynemer, Haig, Handbooks, Hindenburg, Ludendorff, Italian Front, Kaiser Wilhelm, Lafayette Escadrille, Lenin, Literature, Mick Mannock, Manuals, Medical, Memorials, Middle East, Music, Naval, Wilfred Owen, Pershing, Manfred von Richthofen, Eddie Rickenbacker, Isaac Rosenberg, Russian Army, Siegfried Sassoon, Alan Seeger, Storks, Training Camps, Transportation, Trench Journalism, Trotsky, Unit Histories, War Correspondents, Weaponry, with more topics added regularly. ~~~~~~~~ Checks & plastic accepted. Secure server. In business online 10 years..
We have been in business sinc 1963 selling new and used military history. We offer books on all wars and time periods, especially heavy in WW 1 and 2. We also feature a line of Limited Edition Reprints of scarce works in Victorian, World War One and Two history. We also feature an ONLINE SUBSCRIPTION FORM where if you can receive regular email updates of the most recent additions in your area of interest. I have a large selection of World War One titles on hand, aviation, land war, naval actions, biographies, general histories. Your wants are welcomed. I will try to find those titles you need for your collection. Between 3 and 6 books on each CD; all books feature all graphics from the original sources (except for large foldout maps) and have fully searchable computer text. Units currently available: AEF Divisions: 1st , 2nd, 4th, 5th, 7th, 26th, 27th, 32nd, 42nd, 79th, 82nd, 89th. Also American Field Service and Lafayette Escadrille. or to Mike Iavarone (mikei@mcs.com) regarding form and function.